The British Gazette » North Korea: Entering the middle ages. 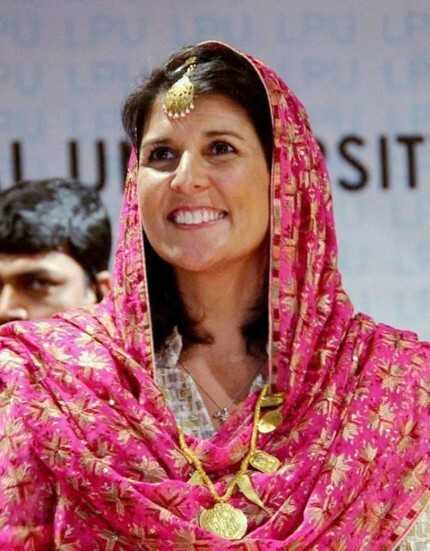 Above, an unusual image of Nikki Haley, born Nimrata Randhawa, former governor of South Carolina now the US ambassador to the UN. This comment can be applied also to the latest and most far reaching set of UN sanctions yet imposed on the inappropriately named “Democratic People’s Republic of Korea” (DPRK) as most diplomats are of the opinion that this is as far as sanctions can go. British Gazette comment: We commend President Trump and Mrs Haley in managing to negotiate the level of UN mandated sanctions they have. The statement that Mr Kim has not yet passed the point of no return is also most welcome. However, the sad fact is that few diplomats or observers believe these punitive measures will force Mr Kim’s regime to halt it’s nuclear and missile development programme. Mrs Haley had prefaced the earlier comment with the statement that the USA was not looking for war with North Korea. This statement of sanity on her part must not however be interpreted as the USA’s acceptance that Mr Kim will be allowed to develop a long range ICBM complete with a two stage thermonuclear warhead and to export same! In other words, the hard pressed people of the so-called, “Democratic People’s Republic of Korea” are going to find their privations already harsh, made harsher still. Meanwhile, as President Putin dryly observed, the North Koreans “will eat grass” before halting their nuclear weapons programme. These privations of the Middle Ages however will not be permanent for it is clear that at some point, Mr Kim will have his long range ICBM and the thermonuclear warhead that is intended to go with it. What is now abundantly clear – hopefully this includes Mr Kim – is that North Korea will NOT be allowed to EXPORT an ICBM with thermonuclear nuclear warhead. NO US administration could tolerate this. IF the Trump administration will NOT tolerate North Korea deploying ICBMs with thermonuclear warheads capable of striking the continental USA south east of Alaska then North Korea will have to dismantle it’s weapons of mass destruction or face the consequences. These have been outlined in previous articles. There are now it seems two endings: a peaceful one and not a peaceful one. The peaceful one was outlined in our article of Friday 8th September 2017. The not a peaceful one is shown in this video: God help us.